United Launch Alliance, the 50-50 joint venture of Boeing and Lockheed Martin, has deployed a payload into orbit to support the National Reconnaissance Office‘s NROL-37 mission for national security. Aerojet Rocketdyne provided three RS-68A booster engines for Delta IV built to provide up to 318 metric tons of thrust each, as well as an RL10B-2 upper-stage engine, multiple attitude control thrusters and 26 helium pressurization tanks. Orbital ATK delivered three thermal shields, three centerbody structures, the composite interstage on the center common booster core, the nose cones on the two strap-on boosters and one set of X-panel structures for the payload. The NROL-37 payload launch represents the ninth deployment via a Delta IV, ULA noted. 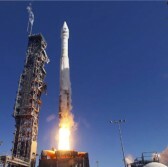 The U.S. Air Force established the commercially-developed EELV program to provide space access for government payloads.